Redesigned with a larger headstock, this neck fits popular "P" bass and "J" bass instruments as an upgrade. It provides a more balanced tonal response by placing each string in the "sweet spot" for tension and harmonics. 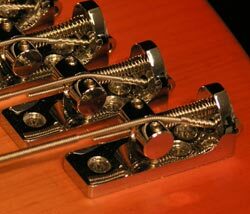 For retrofit: direct replacement for "P" and "J" basses and clones, works within the range of adjustment of the stock bridge. For a custom bass: add a high-quality body with your preferred wood, the pickups of your choice, and Fanned-Fret Innovations individual bridges.